As adults, have we lost that sense of PLAY? Last Friday night, I was invited to join a group of strangers and PLAY. The only rules were no shoes, no talk, and no judgment. I was a little nervous as I drove to the heart of downtown Los Angeles where I would leave my inhibitions behind and PLAY. When I arrived at the location, I surrendered my cell phone, it was not required, but I wanted to experience the evening without distraction. I took off my shoes and stepped into a world that I had left behind years ago. I climbed into a big tube which leads me into a room decorated to provoke PLAY. There was an old typewriter, a big fluffy chair, a piano, a wall for finger painting, and a make-up table. There were balloons overhead with attached messages. I pulled on one, and the note said, “Play pat-a-cake with a stranger.” I did, and the stranger and I laughed. Then a woman painted silver lines and stars on my face. The tempo of the evening kept building. At one point I was dancing without a care, following complete strangers in random movements and poses. After ninety minutes, I was sweating, laughing and feeling alive. 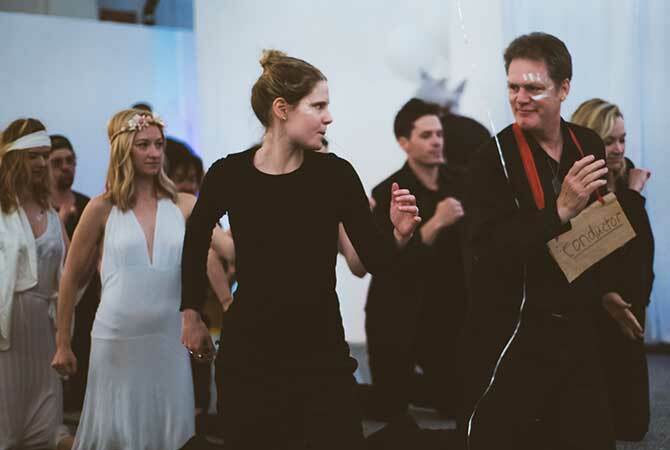 experience and end the evening tearing it up on the dance floor and then return to the next PLAY already in a place of higher confidence and openness. The movement: we all played as children. It’s how we learned, how we related to others. For whatever reason, at a certain point in our lives, we decided we were “too old,” “too cool,” “too professional,” or “too whatever” to play. As adults, we may engage in competitive sports, grab drinks with friends, go to a concert, or do any number of other recreational activities during which we’re often following a familiar script of behavior. But for most of us, pure social and imaginative play is sorely lacking. Make-Life-Play is a social movement to bring more play into all of our lives, no matter how old we are. Why does this matter? Adding more play to your life enhances creativity, improves relationships, increases your confidence, makes you feel joyful, boosting brain function and problem-solving.